After the debate last night, it should be clear for us to point out a winner. Governor Mike Pence was able to pull of an excruciatingly important win which could lead to increasing poll numbers for the Trump Campaign. While Governor Pence promoted Trump’s ideas and strongly defended Trump’s comments, Senator Tim Kaine was on attack mode. Senator Kaine continuously pressed Governor Pence on how he could possibly defend Mr. Trump’s comments about women, his tax returns, and his praise for Vladimir Putin. Governor Pence remained cool and calm and stated that those comments were nonsense. 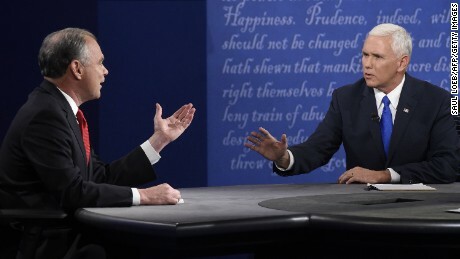 Senator Kaine was also widely criticized for constantly interrupting Governor Pence during the debate. This changed our perspective towards Senator Kaine as he then appeared desperate and rattled. Not only has this great debate performance provoked praise for Governor Pence from many republicans, but has also led to many republicans thinking that the party’s ticket should be flipped. Republicans were very impressed with Governor Pence and they believe that Mr. Trump could learn a couple of things from Governor Pence’s debate skills.